The original chapel was built in 1839 and was the first permanent building constructed expressly as a church in the Port Phillip Settlement. The church was founded by Congregationalists (also known as Independents). The chapel served the townsfolk and the farming community in the vicinity. The first chapel was demolished in 1866 to make way for the church building that you see today. The church was designed by Joseph Reed who also designed The Melbourne Town Hall and The Melbourne Exhibition Building. The church is classified by the National Trust with the highest heritage rating. The design of the church reflects the architect Joseph Reed’s admiration for the Lombardic style – the polychrome brickwork exterior, open cloisters on the side of the building and Romanesque arches. Many of the materials used in the construction of the church walls are materials normally used for houses, shops and factories, rather than major churches. This includes multi-coloured bricks from Hawthorn and cast iron for the pillars and gallery. 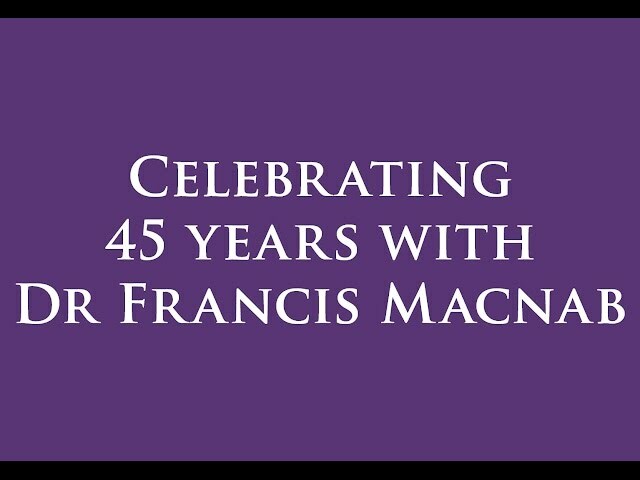 Dr Francis Macnab AM OM PhD DSc DD MA FBPsS was the Executive Minister of St Michael’s from February 1971 to December 2016. In addition to his duties as a minister, Dr Macnab was also the founder and previous Executive Director of The Cairnmillar Institute, a non-for-profit clinic for counselling available to the general public and a postgraduate school of psychology, counselling and psychotherapy. As a registered and practising clinical psychotherapist, Dr Macnab has written over 25 books ranging from spirituality and religion, to psychology and teaching. Through Cairnmillar and St Michael’s, Dr Macnab was able to identify the need for assistance in the older generations, which is why he developed a healthy ageing program called Successful Ageing, Growth and Enjoyment (S.A.G.E.) for people aged between 55-105. Dr Macnab also recognised a need at the other end of the spectrum, The Big Tent Project, aimed at supporting kindergarten aged children suffering from mental health issues. Mingary Counselling Service is another section of Dr Macnab’s on going support for the public. Under the leadership of the Director Dr Lynette Kramer, Mingary offers low cost counselling to the general public where counselled by interns of Cairnmillar completing placement hours. Thus providing students with the appropriate training, but also the public with a sustainable, affordable counselling service. Whilst the study of psychology and religion is not necessarily a new phenomenon, Dr Macnab is one of the only spiritual preachers in the city of Melbourne to accept and encourage people of vast backgrounds to join the congregation and discuss topics of self and living a fulfilled life. Dr Macnab chooses to promote a spiritual awareness as opposed to enforcing religious views but also encourages people to accept them. Dr Macnab is an internationally renowned public speaker, having spoken at several international conferences, he is the former president of the International Council of Psychologists, and a one-time research fellow at Aberdeen University. He holds honorary doctorates from Aberdeen University and RMIT in psychology and Applied Science, and is also a registered psychologist and Fellow of the Australian Psychological Society. In 1992 he was honoured as a member of the Order of Australia. In 2016, he was also awarded Emeritus Professor by The Cairnmillar Institute. Awarded PSI CHI Certificate of the National Honor Society in Psychology of the American Psychological Association. On Sunday, 18 December, 2016, the people of St Michael’s celebrated Dr Macnab’s 45 years of ministry during a special Sunday Service which included the film below. In 1978 a major restoration, refurbishment and modification of the interior of the church was effected. A central aisle was opened through the church and the diagonal aisles regraded. The communion table was raised and the choir and organ console moved to their present positions, becoming part of the arc of its pews. The original wooden pews in the lower story were replaced with more comfortable padded ones. The lectern was replaced and a cross in the Celtic style was included in the items of the chancel. The two candelabras that flank the table give a beautifully cohesive effect to the interior. The candelabras are a ‘Devine presence’ and the symbol of the “Light of the World’ and symbolise the seven Churches of Asia. The people of St Michael’s are proud to be the custodians of such a beautiful church and the generosity of the congregation has enabled us to do great work for the pleasure and safety of all attending. Today the church is noted for its richness and unity. The intricacy and diversity of its painted surfaces is reinforced by the richness of its stained glass, an element excluded from its original design. The development of the interior of the church has been accompanied by fundamental changes in its precinct. In 1991, the modern office building of 120 Collins Street was completed, surrounding the historic church. 2008 marks twenty years since the stained glass windows were installed in the ground floor of the Church. Sadly, Klaus Zimmer died at the end of 2007. He was the artist who created and installed this magnificent panorama of colour and story that will be an evocative adornment in St Michael’s for generations. In 2008, we will remember Klaus Zimmer and celebrate his remarkable work. The windows tell of each person’s journey and the journey of humanity. From the experience of aloneness, alienation and questioning, they move along several pathways to the symbolic gateway of the New Jerusalem. Each window has an inscription as its foot, and combined with biblical references closely follows the poem Streams of Consciousness. The vertical blue line in each window represents the Life Force in everything, while the horizontal red line represents God’s Love that embraces the whole of the creation. The windows are numbered clockwise, starting at the rear left of the church, facing the pulpit. Windows 1 to 7 are on the left wall, 8 to 14 on the right and 15 to 19 are on the rear or south wall. Alien, yet citizen of the world, Guardian of the cosmos earthdust discovering the gift and power of a New Creation. Windows 4, 5 and 6 are a trilogy representing the turbulence and hope of our journey. Windows 10, 11 and 12 are a trilogy on the Dance around the Golden Calf. Windows 15 to 19 portray the Gateway to the New Jerusalem. We turn from the body of the Church to go out into the city.